Interactive GIS access in our projects has enabled us to create data, and assemble it with other information. It shows on the screens well-known to our clients. One tactic we have used since GIS maps became commonplace (about 2000), is to treat GIS Maps as Data. We show these GIS images and interactive maps to our clients in a variety of ways. We use the ESRI interface (shown below) allowing viewers to zoom into an area to examine hazard mitigation measures. Viewers propose layout designs, or inspect habitat modifications detailed in written materials. The power of these programs rests in their format as members of the Open Source Geospatial Foundation (OSGeo). These software platforms are enabled through a share-ware format. There is no cost to download, install and use the software. Most of these platforms can display GIS data through a web interface. Each of these events indiscriminately crossed county and state boundaries to char lands in the path of the inferno. Although some of these blazes appear to be small, the size shown here only reflects the impact on Benewah County. For instance, the 1927 wildfire event torched a total of 28,300 acres in Benewah County and adjoining areas. At the bottom of this page is an Interactive GIS map showing the potential mitigation measures we developed. These were each identified for implementation by the cooperating agencies and organizations. Many of these activities were implemented and made a real difference in the lives of Benewah County Residents. This type of Interactive GIS map made available through web access to the planning team is effective. Cooperators continued to access this page for many years after the planning document was adopted. Make Benewah County residents, communities, and businesses less vulnerable to the negative effects of natural hazards. Complete this through the effective administration of hazard mitigation grant programs, hazard risk assessments, and wise and efficient mitigation measures. This is a coordinated approach to mitigation policy through county, Tribal, state, federal, regional, and local planning efforts. The combined prioritization is the protection of people, structures, infrastructure, economy, and unique ecosystems. These contribute to our way of life and the sustainability of the local and regional economy. Institutionalize and promote a county-wide hazard mitigation ethic through leadership, professionalism, and excellence, leading the way to a safe, sustainable Benewah County, Coeur d’Alene Tribe, and local municipalities. 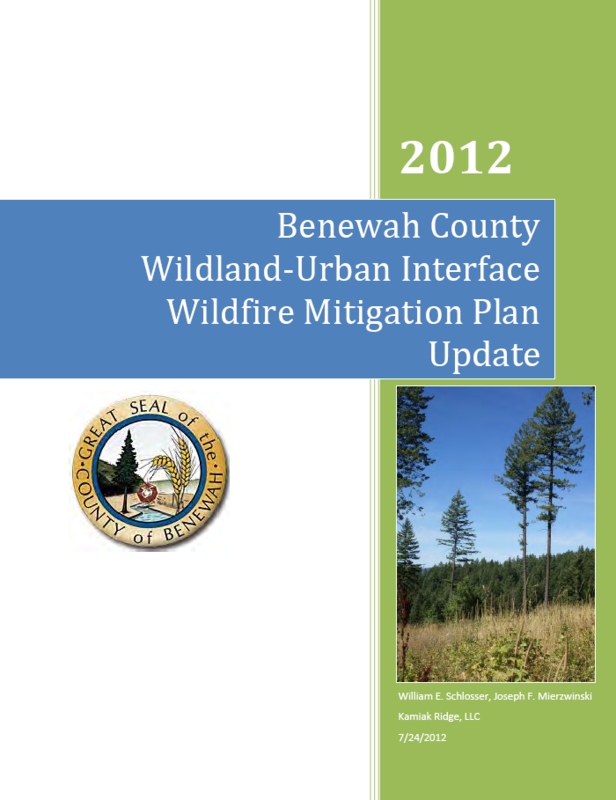 The Benewah County Wildland-Urban Interface Wildfire Mitigation Planning Committee has adopted a series of primary goals. These are intended to benefit each populated place, municipality, and the county’s residents and visitors. Reduce the area of land damaged and losses experienced because of natural hazards where these risks threaten communities in the county. Prioritize the protection of people, structures, infrastructure, and unique ecosystems that contribute to our way of life and the sustainability of the local and regional economy. Educate communities about the unique challenges of pre-disaster hazard mitigation and post-disaster response. Establish mitigation priorities and develop mitigation strategies. Strategically locate, plan, and implement hazard reduction projects. Provide recommendations for alternative treatment methods that can impact the exposure to multiple hazards at one time. Promote and implement disaster-resistant development policies. Build and support local capacity to enable the local government and the community to prepare for, respond to, and recover from disasters. Reduce the threats to public health and safety posed by natural hazards. Reduce the long-term costs of disaster recovery and disaster mitigation through intelligent and strategic mitigation policies and practices. Identify and facilitate the management for sustainable land use in light of natural hazards and our management of the land resources. This map is scalable (zoom in and out), panable, and shows data layers with Potential Wildfire Mitigation Project Areas for the Planning Committee and the Public to Browse and comment.